Paul Tritschler considers the role of community in the development of selfhood, and its part in the meaningfulness of one’s existence. Shortly before I left Cornwall, a bloom of barrel jellyfish appeared just below the surface of the unusually calm Mevagissey waters. Aptly named – they have all the rounded bulk of beer barrels – they drew a fascinated crowd to watch them from the harbour’s edge. With some effort I squeezed through and squeezed out a few photos, but none came close to capturing the splendour of this convoy pulsating purposefully and gracefully along the coastline. It was the stuff of dreams, as though watching strange life forms cross over to our realm from the netherworld of Hieronymus Bosch. The stuff of dreams, but perhaps also a portent. The ethereal visitors brought to the fore the formidable uncertainties many of us share about climate change – villagers said they had never before seen barrel jellyfish in such large numbers – and beneath their fascination lurked the very real dread that if the balance tips and sea levels rise, there will be no turning back. Everyone in the area, after all, knew a thing or two about floods: each year brought a new rainfall record, and many had lost their home or livelihood. When it comes to our living breathing planet, as with our living breathing selves, there is no reverse gear, yet in the case of at least one species of jellyfish, the Turritopsis dohrnii – found in the Mediterranean and in the waters around Japan – its key feature is precisely that; this luminous, and simply beautiful yet entirely complex creature, floating, drifting, sinking with the currents, possesses the power of immortality. 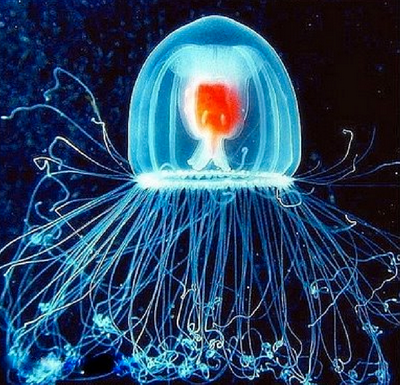 Whilst humans developed a limited life span and an acute awareness of that fact, the Turritopsis dohrnii, though it is in no way self-aware, developed the ability to reverse its ontogeny, to turn back its life cycle in times of threat – be it environmental or simply the threat of old age. Many might begrudge the fact this ability had been bestowed on a bobbing blob of mindless jelly. Indeed, a variety of life forms are envied for their selective advantages – speed, strength, flight, longevity, regeneration, and perhaps also that living-in-the-moment quality associated with blissful ignorance: lacking awareness of their mortality, animal kingdom dwellers are unperturbed by advancing years, and live their lives to the last breath in simple pursuit of food, play and romance. Consciousness of selfhood, of our place in the universe, and of our relationship with all living things, comes at a cost: the certainty of our demise and, what is often worse, the demise of others. This uniquely human grasp of the inevitability of death, and of the fact it can occur without warning, embodies the potential for immense psychological distress – we share with all animals, after all, the drive for self-preservation – but it also carries the potential for a richly meaningful and purposeful life, and research appears to support this. A growing body of experimental evidence derived from Terror Management Theory, an approach that emerged from within existential social psychology, suggests increased awareness of mortality leads, correspondingly, to increased investment in those resources that provide meaning – social and cultural structures such as family, community and social identities – and that this in turn reduces the fear of death. But if pondering death can bring a sense of purpose, of meaning, and perhaps a degree of happiness to one’s life, might pondering the issues of age do the same? Age rarely gets a good press. No one relishes the thought of ageing, of entering the realm of the forgotten, of finishing in that bleak place depicted by Larkin in his poem, The Old Fools: ‘the hideous inverted childhood, the power of choosing gone – why aren’t they screaming?’ The modern panic of ageing might be greater than the fear of death, for a host of reasons. On the road to being physically and mentally worn out, the process may involve the loss of those ingredients that go into the mix of a meaningful life: family, friends and social networks, experiences, accomplishments and recognition. Wisdom, though there is nothing necessary or causal about the process, often accompanies age, but even here one might reasonably ask what wisdom is, or might be, in the absence of any sort of meaningful community. As Bette Davis succinctly said, old age ain’t for sissies, and certainly there are features of the ageing process that in the estimation of many far outweigh the benefits of pondering life’s purpose. Consciousness confers on us the ability to ask questions about life’s meaning, to probe the possibilities of a better world (perhaps even another world), and to make choices regarding how to live and even whether we live; but unlike the squirrels in the trees dreamily dropping conkers on the cars below, consciousness also reminds us of the mileage on the clock and gives a rough estimate of the time left on the journey – a journey that seems to accelerate with age. And if that isn’t bad enough, it also provides partial glimpses of the sort of life that awaits us further along the road: infirmities, indignities, and relative isolation, prejudice, poverty and perhaps loneliness. What if this, in the words of Jack Nicolson, is as good as it gets? At Norwich Playhouse, Scottish comedian Fred MacAulay escorted a largely middle-aged and, as he described it, middle-class audience on a cruise around pensions, the raising of the state retirement age, life expectancy in Shettleston, and bucket lists, and at one stage found himself politely upbraided on a point of political correctness by a young doctor in the stalls: ‘We no longer refer to people as being old’, she declared, ‘but as older’. The mature Mister MacAulay deftly deflected the delicate point and resumed his steady flow of humorous anecdotes. But threading through the old – older? – lanes of Norwich later that night, I found myself pondering the policy of promoting manufactured politeness at the expense of radical social change. The shift in emphasis from old to older, however well-intentioned, is a disavowal of age. Echoing prejudiced attitudes towards women – where the measure of their worth is made by comparisons with men – it defines the value of life by its proximity to a younger population, a cultural dominance reinforced by stereotypical statements: looking young for your age, as fit as a younger person, an alert young mind, performing tasks as well as someone much younger, maintaining a role in occupations that are believed to keep you young, and of course, not old, just…older. There is at one end of the continuum a healthy cadre of activists who accept age and its limitations, and who continue as best they can in the fight against inequality and discrimination, who resist local and global injustice, and who organise to make the world a better place using age itself as a campaign platform – Harry Leslie Smith being a notable example. At the other end are those who bend to breaking point in response to social pressures that seem to demand the impossible – like the Turritopsis dohrnii, that we age in reverse. The forces that orientate the world towards waste, obsolescence and disposable incomes, tend to engender a sense of shame about growing old. The response is often one of compulsive working, excessive exercise, diet regimes and ‘think yourself younger’ fads, cosmetic surgery, depression and suicide. The latter, though often twinned, are not knotted together in anything like a causal sense, but it is worth noting that suicide, possibly as a growing alternative to growing old, has increased dramatically in recent years – up by almost fifteen per cent in the UK among the over fifty-fives, and much higher in regions of severe material deprivation. The dominant perspective on concepts such as independence and community tends to be articulated in the language of rational accounting procedures; in the current epoch it is expounded by the messiahs of market fundamentalism, packaged in that worldview, or perhaps faith, popularly known as neoliberalism. This ideology focuses on independence through the distorted lens of economic reasoning, showing the ideal individual as a competitive, autonomous, possessive, self-reliant, self-sufficient, self-interested human being – some might prefer the adjectives greedy, grasping and egregious. Community, in this view, as in Thatcher’s society, is more or less disregarded, and dependency is equated with sickness or inadequacy. It is in part against the backdrop of neoliberalism that the increase in the suicide rate must be considered. Over 20 per cent of the older population are living in poverty, a problem intensified by the infirmities associated with old age and the increasing dependence on diminishing resources of quality care. Their powerlessness, however – as in racism and sexism – is not reducible to economics or class in any simple sense, but to attitudes. We are, above all else, social beings. Theoretical approaches of the more people-centred variety suggest the self-concept – composed of the beliefs one holds about oneself, and based mainly on the reflections of others – continually develops throughout life’s course. It is realised through interdependence, and a tolerant community is where this happens: something we might define as a lifelong human resource that is vital for individuals to flourish. Attitudes towards older people, and ultimately our older selves, remain a key problem, and token references about them being the same as the young, just older, won’t make much impact on inequalities and access to resources, human or financial. But the centrality of community to the development of a sense of self throughout the course of one’s life, and to the quality, purpose and meaningfulness of one’s existence, must also be recognised. That discussion has hardly begun. Changing the perspective reveals the immortal jellyfish in a position that is less enviable, a light that shows it trapped in a perpetual cycle, unable to learn, adapt, or move on. I wonder if many of us are psychologically closer to the immortal jellyfish than we might care to admit: some stuck in that loop of longing to have their youth over again, or in that rut of regret for wasting it. Perhaps some spend inordinately long periods of time tumbling the same thoughts over and over wishing for something they had all along: the power to change. You’re a poet and you don’t know it…. Thanks for this, Mr Tritschler. Has been an ever increasing, back of the mind realisation for myself over the past few years just how interconnected the increased problems with mental health, erosion of ‘community spirit’, promotion of self-promotion/individual gain and the tunnel visioned, destructive ideology of neoliberalism really are. This observation that we are not looking at ways to accept old age and deal with it, instead attempting to preserve the more appealing and of course increased monetary value of youth is another strand that I had not considered.